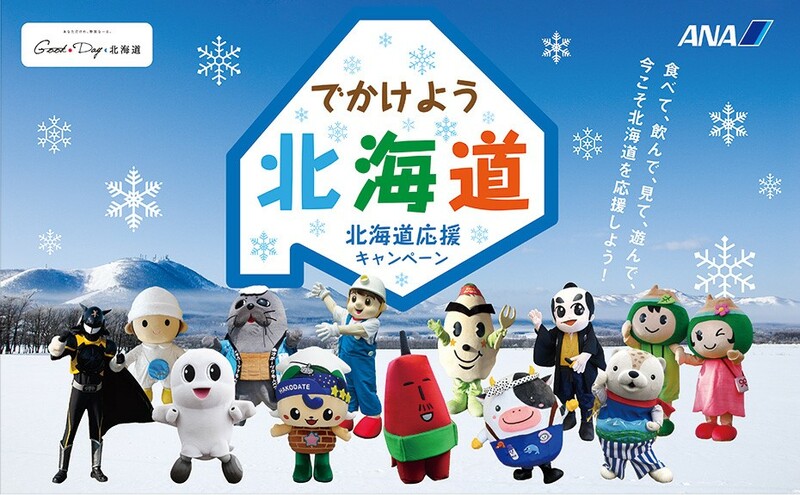 Let us introduce the town of Betsukai located in the east of Hokkaido. Half of the town is pasture, with a prosperous dairy. We produce excellent quality milk, cheese and ice cream. 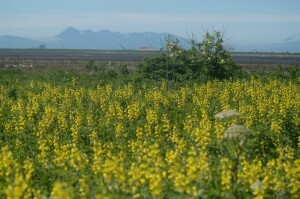 The town is also on the sea of Okhotsk and has a thriving fishery. Salmon, shrimp and scallops are specialty products. Kunashir, an island of the Northern Territories currently occupied by Russia, can be seen in front. 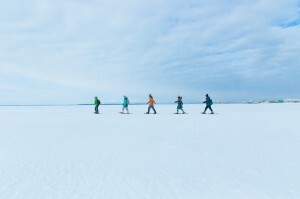 There are no mountains, and because of the free open space, you can see the scenery of majestic Hokkaido, with delicious food and a hot spring. 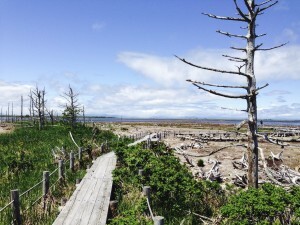 The most popular sightseeing spot in Betsukai is Notsuke peninsula. Notsuke peninsula is a 26km long sand spit, Japan’s largest, made from deposited sand from ocean currents from Shiretoko. It has an unusual shape like a shrimp. As the base of the Notsuke peninsula is very narrow, the sea is visible on both sides of the paved roadway. People say that it looks like a bridge over the sea, but its appearance is from the natural features of the terrain. 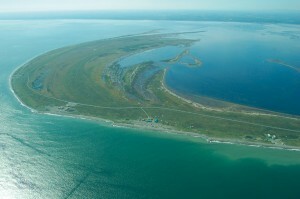 In addition, since the peninsula is so flat, it is characterized by 360-degree panoramic scenery. There is a Nature Center about 15km from the base of Notsuke peninsula. 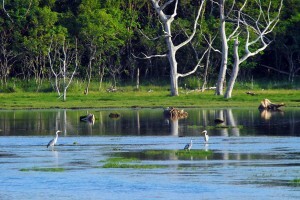 There are guides available who really know about the local nature and wild birds. Walk about 1km along the path from the Nature Center and you will arrive at the unique scenery of “Todowara”. 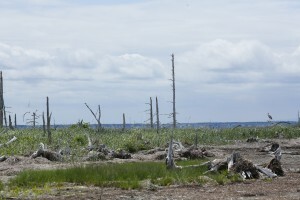 “Todowara” has fossil “fir” left standing by the erosion of sea water and the subsidence of the peninsula. In the past, there was a forest, but now only white stems and roots are left. In 120 years it has been said that it will sink to the bottom of the sea. This place is popular for photographers. It has been designated a natural park, without any manmade structures, and the starry sky also looks beautiful. 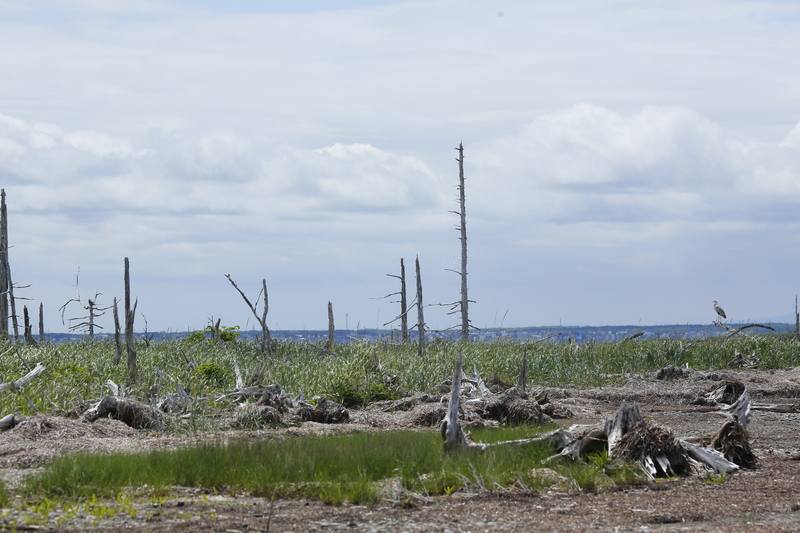 This is a “Narawara” where dead trees are lined up in the middle of the Notsuke peninsula. There are many inhabiting wild Yezo deer and birds. 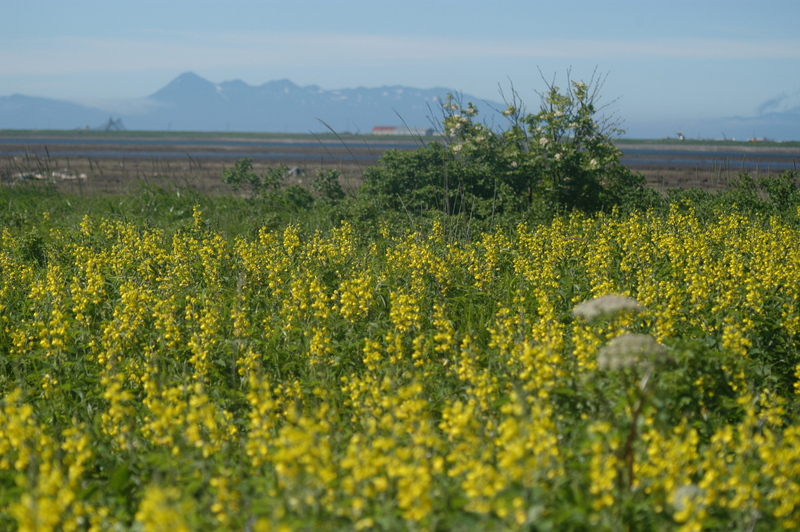 As summer follows spring, there is a natural flower garden. Japan’s mystical flower “Fritillaria” which is only seen in the mountainous regions of Honshu blossoms around your feet. One kind of flower fills the prairie at a time, and the colors change splendidly from orange to purple to yellow to pink like a carpet for two weeks. October is also amazing. At night it is often zero degrees, and can suddenly become cold. When the difference between the sea and the air temperatures goes past a certain point, a unique phenomenon happens to show sunrise like variations in a mirage. Winter becomes a world of snow and ice all around. This area is sunny most of the time in winter, the contrast of the blue sky and the white icy ground is beautiful. The real winter comes in February. 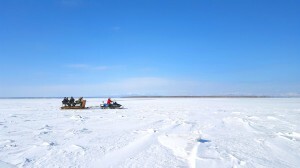 Drift ice will come from the Amur River in Russia. 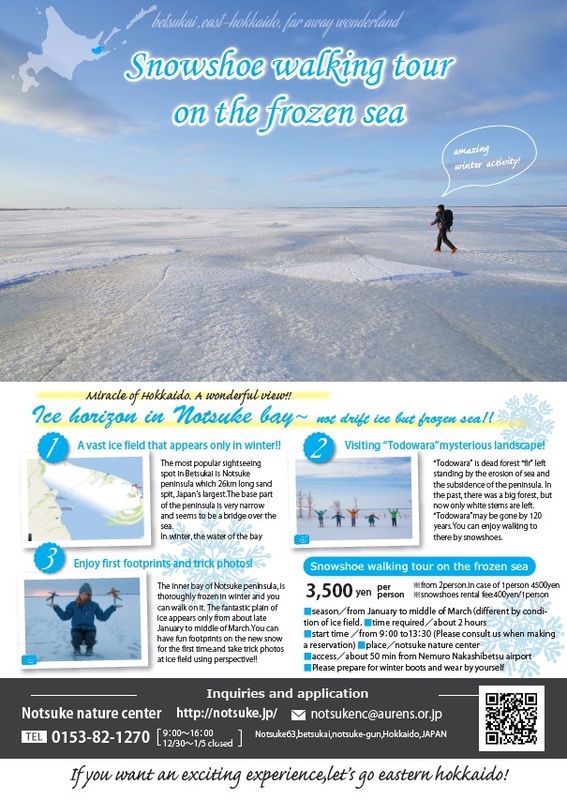 As drift ice fills the sea in Monbetsu and Utoro, ice breaking cruises and walking on the ice become popular. On the south side of the Shiretoko peninsula, drift ice becomes smaller and forms unique shapes from colliding with other ice. You can see most of the wild animals that inhabit Hokkaido in Betsukai. Notsuke peninsula is a “bird paradise” where more than 235 bird species are seen among about 630 species in the whole country. 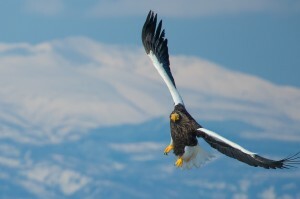 The white-tailed sea eagle is a resident bird and can be seen all the year round. Steller’s sea eagles in winter, child-rearing cranes in summer and other birds such as sandpipers and plovers can be seen. You can see Steller’s sea eagles closely when they stop on a telephone poles. Betuskai is rooted in the natural environment, wild animals such as the Yezo deer and red foxes live freely here. 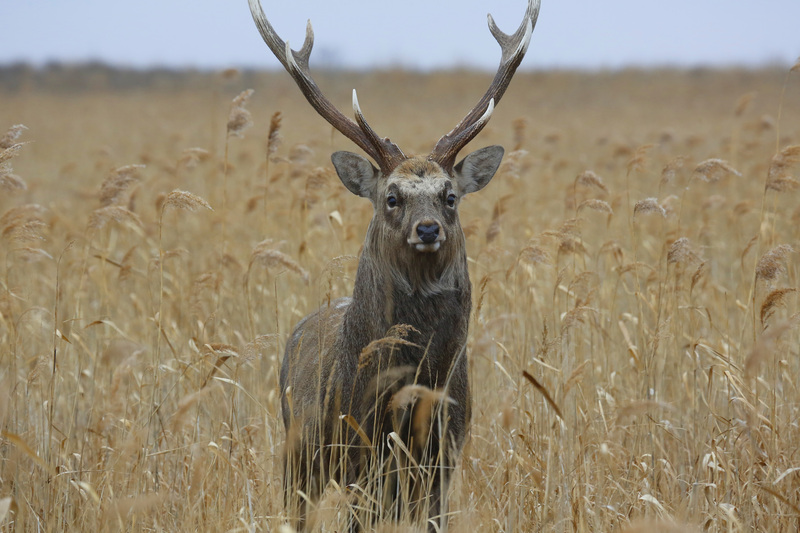 In particular, on Notsuke peninsula and near the lake Furen you can see herds of Yezo deer. These deer, larger than the Shika deer of the mainland are impressive. 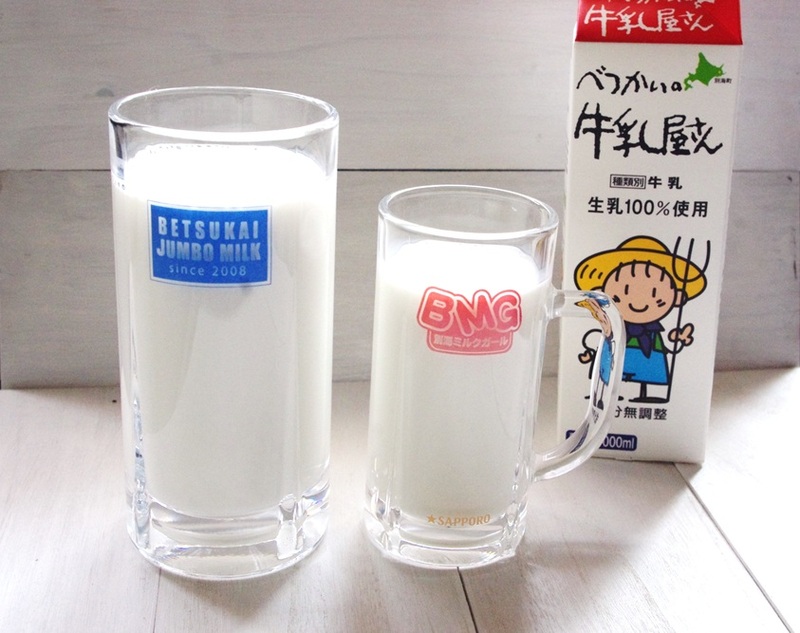 Betsukai is Japan’s largest milk producing area. We recommend our delicious dairy products. 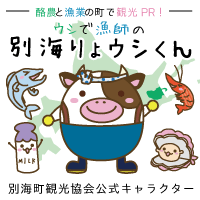 You can taste milk, ice cream and yoghurt made from the milk of free range cows drinking water filtered through subsoil from the mysterious lake Mashu. December to May. 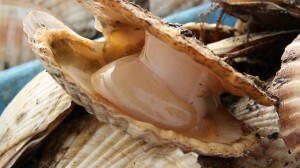 Scallops caught outside of Notsuke peninsula are bigger than the palm of an adult hand! A special product of Betsukai, is the original burger of a large scallop in a spring roll wrapper sandwiched in a milk bun. Fun to eat assembled by yourself. 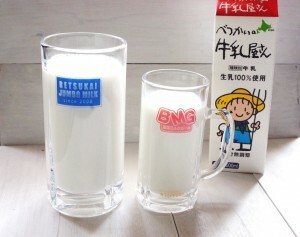 As it’s a dairy town, you get a 500ml milk included in the set. 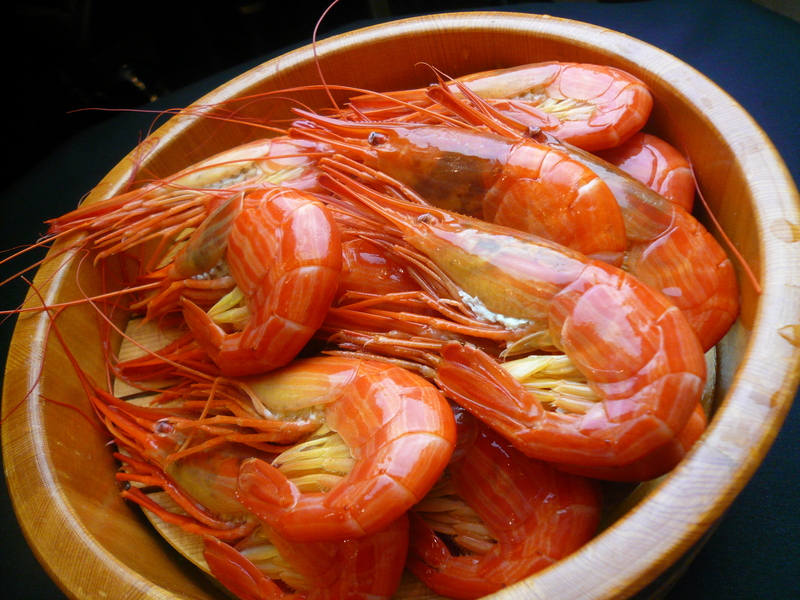 Shrimp with striped bodies are a specialty. The shrimp is caught by a traditional fishing method from the Edo period, from a white sailed sailing boat, and is delicious. We eat boiled or as Tendon. The fishing season is twice a year, June to July and October to November. 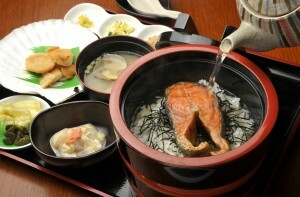 Original “Ochazuke” fillet of branded salmon “Nishibetsu Salmon” as presented to the Tokugawa Shogun in the Edo period. 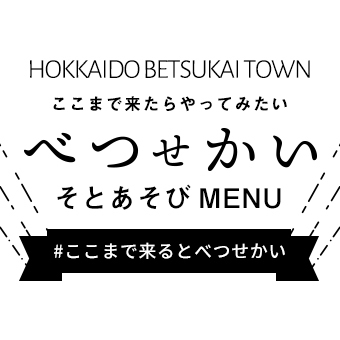 You can have it at 4 different inns in Betsukai. The flavors are different at each inn, such as kelp, scallop and Sakebushi (shaved dried salmon). Sightseeing boats cruise the Netsuke bay surrounded by the Netsuke peninsula, Japan’s largest sand peninsula. Operating from Golden Week in May to the end of October. 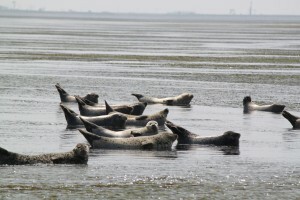 There are a lot of wild seals inhabiting because the water is shallow and predators cannot easily enter. You can observe them from the boat with a nearly 100% encounter rate. 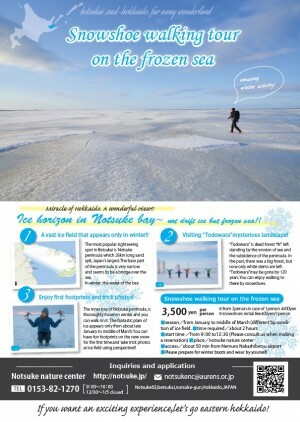 Notsuke bay, the inner bay of Notsuke peninsula, is thoroughly frozen in winter and you can walk on it. The fantastic plain of ice appears only from about late January to early March. Walking on the snowfield of no footprints. 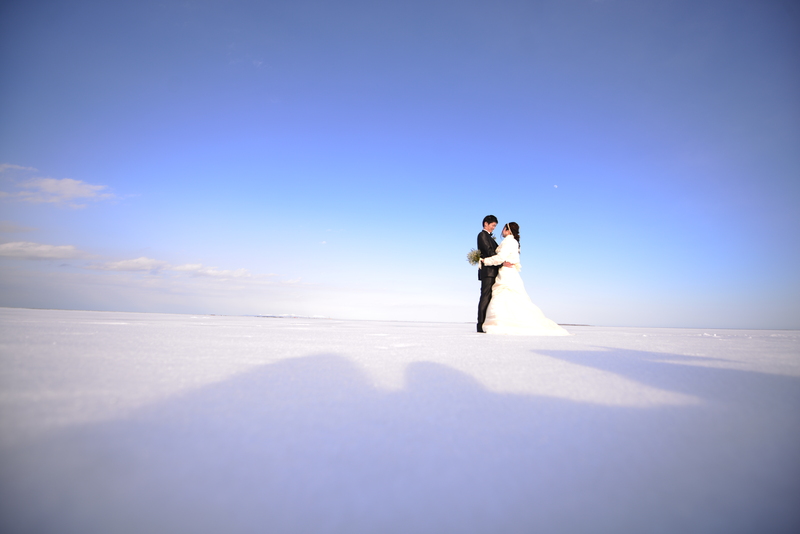 You can do this because on the ice of Netsuke bay, there is nothing reflected in the picture. You can take trick photos using perspective. *On ice, for safety, you need to be accompanied by a guide. You can ride a sled that pulls with snowmobiles on the frozen sea.The journey time is about 1 hour.Free lending for cold weather wear available. 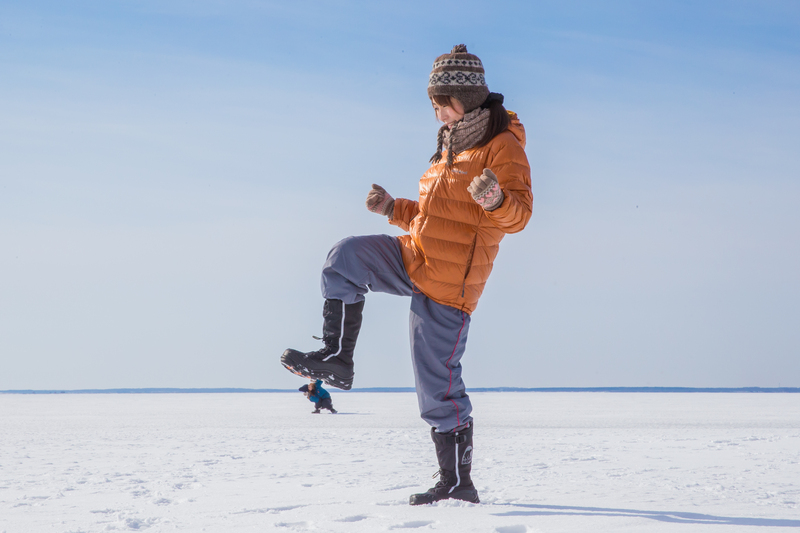 Through early March from late February, drift ice will be forming. A large lump of drift ice sometimes drifts along the coast, so you can really touch and take a commemorative photograph freely in front of the Nature Center. (There may not be drift ice every year). 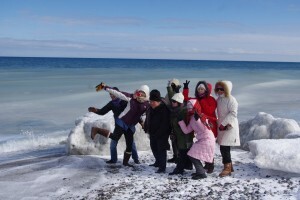 Commemorative photo with drift ice on the coast in front of Nature Center. 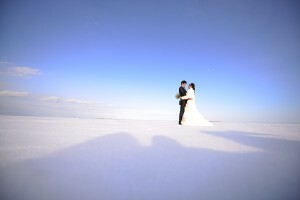 While enjoying the magnificent views of the Betsukai, you can do location shoots. Please make memories for both of you. Please contact this company for more information. Accommodation in Betsukai is small-scale and has a homelike atmosphere. 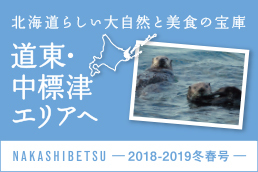 Most of the inns have got hot springs and the Japanese style of a luxurious dinner of mainly seafood is also popular.The Odaito area is convenient for sightseeing around the Notsuke peninsula. 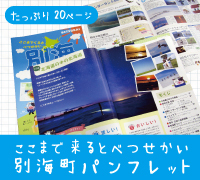 For more information, please visit here (Japanese). A convenient way to get to Betsukai is by air. As public transport is limited, mainly travel will be by participating in group tours or by rental car. 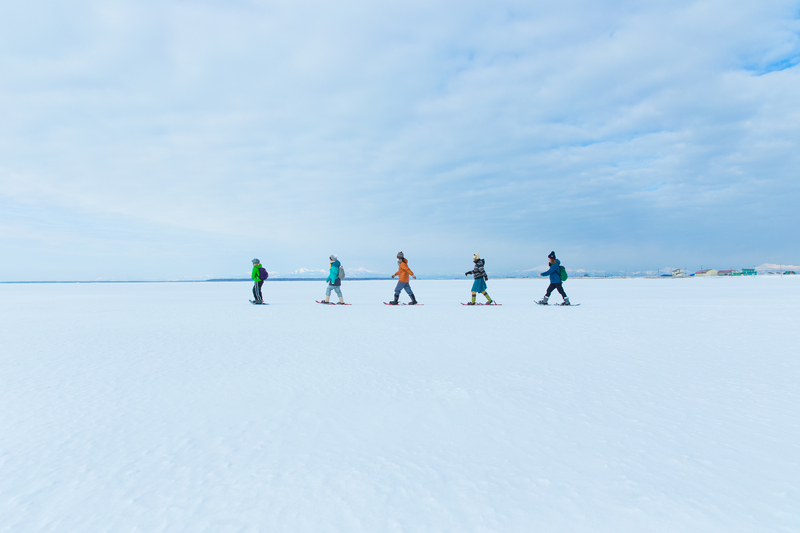 By going a little further, you can experience a more profound Hokkaido. Wi-Fi is available at Road station Odaito and often in accommodation lobbies.